Just a few words on Joe Meno’s Toy Story Flickr photostream — WOW! Fantastic! Amazing! You can view all of his photos from Day 1 in this set. 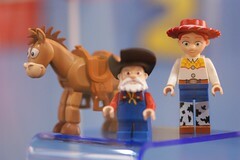 Now pick up your jaw and dream of Toy Story LEGO until January 2010.